But neuroscientists say it is far too soon to declare handwriting a relic of the past. 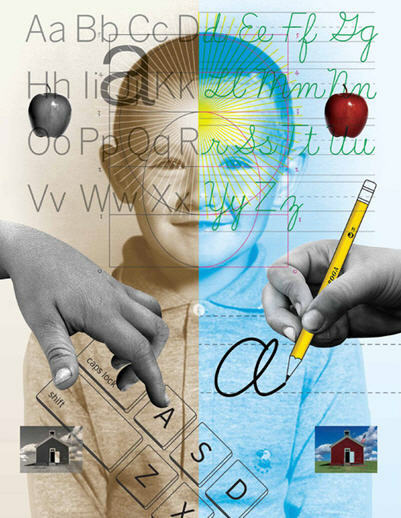 New evidence suggests that the links between handwriting and broader educational development run deep. “When we write, a unique neural circuit is automatically activated,” said Stanislas Dehaene, from the Collège de France in Paris. “There is a core recognition of the gesture in the written word, a sort of recognition by mental simulation in your brain. A 2012 study led by Karin James, from Indiana University, lent support to that view. Children who had not yet learned to read and write were presented with a letter or a shape on an index card and asked to reproduce it in one of three ways: trace the image on a page with a dotted outline, draw it on a blank white sheet, or type it on a computer. They were then placed in a brain scanner and shown the image again. Reflection: Instead of giving a computer for continuous use to children with academic difficulties, such as dysgraphia, the child may have to be trained to write as well as he can (while using his computer) instead of giving up! 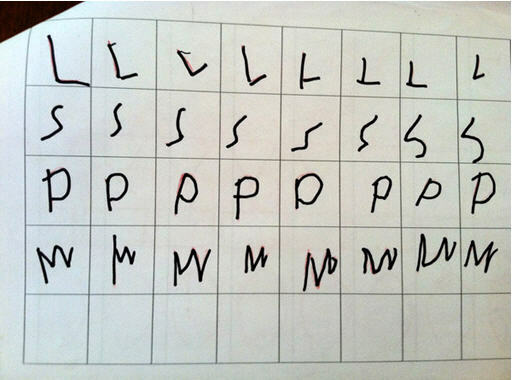 Motor training can only help the child to write better. But as today, things that do not require any effort seem to take precedence. So, it is up to you, parents, to lead this battle! Competent reading essentially involves the whole-word or lexical process of reading which ensures fluent reading and a “direct” access to meaning. It recognizes the shape of the word and immediately find its sound correspondence in memory (or phonological), the meaning of the word being evoked, which is the ultimate goal of reading. The whole-word process (or eidetic = photographic), both more automatic and faster, can even bypass the phonological pathway, which is more controlled and slower. Most of the time, the expert reader would not need to use his phonological knowledge to recognize written words. The observation of a double dissociation between visual and phonological dyslexia in patients with brain damage is an argument in favor of the neuropsychological existence of the two independent procedures for the recognition of written words (Coltheart, Masterson, Byng, Prior & Riddoch, 1983; Funnell, 1983; Shelton & Weinrich, 1997). Numerous studies supporting these models have also emphasized the optional phonological code while reading (Peereman, 1991, for a review). Coltheart M, Masterson J, Byng S, Prior M, Riddoch J. Surface dyslexia. Q J Exp Psychol A. 1983 Aug;35(Pt 3):469-95. Funnell E. Phonological processes in reading: new evidence from acquired dyslexia. Br J Psychol. 1983 May;74 (Pt 2):159-80. Weinrich M, Shelton JR, McCall D, Cox DM. Generalization from single sentence to multisentence production in severely aphasic patients. Brain Lang. 1997 Jun 15;58(2):327-52. Peereman R. Phonological assembly in reading: lexical contribution leads to violation of graphophonological rules. Mem Cognit. 1991 Nov;19(6):568-78. When the child becomes able to recognize a word as a unit, he gradually builds his orthographic lexicon. The operation of this lexicon is not yet fully known, but it seems to be like a dictionary which exists in our brain, allowing rapid identification (the faster the more familiar word) and immediate access to meaning. This procedure then develops to become more and efficient as reading becomes more competent. Ultimately, the adult reader would only use the “photographic” procedure, which is obviously much faster than going through words syllable by syllable (which remains necessary when we must read for example, new or meaningless words or of a foreign language). In the first case, the child immediately recognizes the words and understands what he reads. In the second case, the child does not read words but syllables one by one. Difficult to quickly understand what is read. Surface dyslexia, in its pure form, is characterized by a selective impairment of reading irregular words while reading regular words and pseudo-words is relatively preserved. This selective difficulty reading irregular words translates a dysfunctionnal lexical reading procedure. These children do not present associated disorders of oral language and have good capabilities in short term verbal and workong memory and have good phonological awareness. They also have difficulties in visual processing that make comparing sequences of letters or identify targets among others. It is said that pure forms of surface dyslexia are relatively rare in clinical practice. But I can assure you that in my optometric practice, these children are much more numerous than the statistics show. There is also, according to some authors, another form of dyslexia, called “visual-attentional” where the child has a good memory of the spelling of words and is able to transcribe sounds into words. For cons, the type of errors encountered in this disorder is reversals in groups of letters, omissions, additions, approximate reformulations, skippng lines while they read. 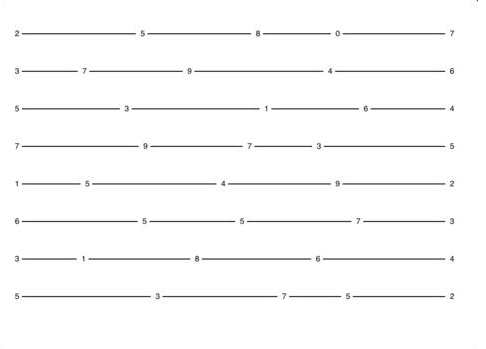 line breaks. 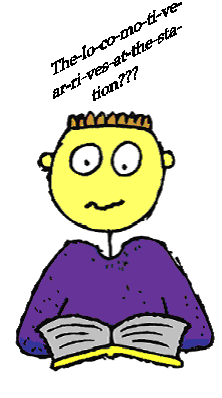 The child may confuse letters and words with others closely resembling it. It would be a disorder affecting necessary attention for an effcient reading activity. These children also have oculomotor (eye movement) and visual discrimination problems, difficulties in visual attention, difficulties in copying material from a book or the blackboard. Valdois S, Launay L. Évaluation et rééducation cognitives des dyslexies développementales: illustration à partir d’une étude de cas. In : La rééducation neuropsychologie : Études de cas. AZOUVI P, PERRIER D, VAN DER LINDEN M (eds). Marseille, Solcoll, 1999 : 95-116). It is probably unnecessary to say that the best readers are those who read in a whole-word fashion, this method of reading is fast and understanding is also much better. But what is the action to take if a child uses no or has a poor orthographic lexicon? We must ensure that the related visual and perceptual skills are adequate. Otherwise, visual training will be needed to improve these skills. What are the skills that have a close relationship with the development of orthographic lexicon? First, eye movements: reading requires a constant movement of the eyes along a line of text, which is done by a series of short jumps (saccades) interspersed with longer breaks during which takes place all intake of visual information. These jumps between fixations are very short, about one-thirtieth of a second. Saccades take approximately 250 to 300ms. Saccades are also an index of visual attention. We have tests that evaluate the speed, accuracy and fluency of reading. Eye movement problems hamper efficient learning and reading quality (failure to follow the text, loss of place, jump words or lines, etc.). For reading to be effective, eye movements must be flexible, fast and accurate. Then visual attention and concentration allow the child to remain focused and attentive to every detail of what we see and as long as necessary. Attention and concentration are a preqequisite to good visual discrimination. In addition, visual attention is the link between perception (making information available) and cognition (use this information). It ensures maximum reception all the information from our visual environment. Visual concentration promotes maximum use of working memory to collect, store, retrieve and process the relevant information. It facilitates the work and especially the intellectual performance. Short-term and sequential visual memories allow the child to recognize an item after a brief exposure, or to recall items in the same order and in the same sequence. For example, remembering the order of letters in a word or words in a sentence with a quicker understanding of what is read. Children who show difficulties in visual sequential memory may have difficulties copying information from the board or a book, to learn to read mulriple words or sentences and remember what they read. They may also have difficulties in creating their orthographic lexicon, which affects fluency and reading comprehension. In summary, the eyes must move effectively to ensure high quality of visual information, and the child must be able to remain attentive and focused on what he reads. Visual memory will also allow to recognize the same words in a text. Many children can not build a orthographic lexicon because they can not even recognize a word they just read and read again a few lines later. Visualization allows the child to “juggle with words” in his head. And finally, it is practicing reading every day that ensures efficiency in reading. More often we see the same words, the faster they will be included in the orthographic lexicon. According to scientific research, three basic skills (among others) will thus directly influence reading performance in children: visual memory, visual attention and visualization. The best readers are capable of recognizing whole words easily (eidetic, global or whole-word reading). This accelerates visual decoding, requires less energy and promotes better understanding. Reading phonologically (syllable by syllable) slows down the reading process and does not guarantee an adequate understanding of a text. The best readers need not phonological awareness to read and can recognize most words without having to dissect them. That is why we have developed a particular portion of our vision therapy to enhance these perceptual abilities. We try to develop better whole-word reading to improve reading efficiency and comprehension. “True“dyslexia is seemingly a “neurological” dysfunction (of course, we read with our brain, not just the eyes!) marked by the inability of the brain centers to efficiently decode print or phonetically make the connection between written symbols and their appropriate sounds. The connotation of the word “neurological” can be confusing: this word is too easily understood or related to a nervous system disease. Dyslexia may be caused by a nervous system dysfonction, but surely not a disease! Livingstone MS, Rosen GD, Drislane FW, et al. Physiological and anatomical evidence for a magnocellular defect in developmental dyslexia. Proc Natl Acad Sci USA 1991; 88:7943-7. Moreover, all children with learning difficulties in primary school are not dyslexic, and vice versa, a child may be dyslexic without it being prolonged failure (especially if dyslexia is mild and if it can be compensated by the development of other skills intact). Essentially, there is also a problem in the clinical definition of dyslexia. Everyone has their own definition and tests used in the diagnosis of such a condition do not always lead to a clear diagnosis… This imprecision in diagnosis can also certainly explain the variability in prevalence rates reported in the literature (this rate may actually increase from 4% (Yule and Rutter, 1973) to 20% (Shaywitz, 1996)). Yule W, Rutter M, Berger M, Thompson J. Over- and under-achievement in reading: distribution in the general population. Br J Educ Psychol. 1974 Feb;44(1):1-12. Shaywitz SE. Dyslexia. Sci Am. 1996 Nov;275(5):98-104. A child in early primary school may have some difficulty learning to read, this situation is common and there is no question of going overboard and put a label of “dyslexia” for all these children. The dual-route model is very frequently used as a reference model for decoding during reading. This model postulates the existence of two procedures involved in both reading and writing. The phonological process is characterized by a sequential analytical processing or syllabic of a word or pseudo-word (invented word). It involves a system of rules for grapheme (a letter or two, sometimes three) – phoneme (sound related) explicitly learned in school. The word “camel” when processed through this system will be segmented into graphemes <CA – MEL>, then each grapheme will be assigned to a phoneme which is most frequently associated in the language This allows to generate the sequence of the word. Only the phonological process allows the processing of new words (words not previously learned or “pseudo-words” which are words invented for the purposes of experiment, for example: famsled, posvent or rolted). Insofar as the treatment of new words is dedicated to this system, lists of pseudo-words are systematically tested for reading and dictation for children with difficulties, to test the integrity of the phonological process. Good performance in reading invented words indicates that the phonological process is operational, poor performance involves an inadequacy of this pathway. It is known that the analytical (phonological) route plays a major role in early learning as it is chronologically the first. If we conceive that in adults both channels are relatively autonomous, it seems unlikely that these two pathways are also distinct in children who are learning to read. The lexical procedure (or whole-word process) performs simultaneous processing of all the elements of the word. 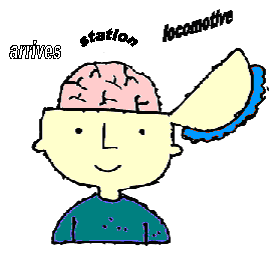 All units which compose the word are processed in parallel, leading to the activation of the orthographic lexicon stored in the brain and learned previously. The child sees the word and understands it immediately. In reading, and after some visual processing, the representation of the word as a whole is activated in our orthographic lexicon (the “dictionary within our head”) and gives a very rapid access to the sound structure (phonology) corresponding to this word and its meaning. No need to decode the word syllable by syllable. The way this lexicon functions is not yet fully known, but it seems to be like a dictionary to which we would refer for each word read, according to a “photographic” procedure, allowing rapid identification (the faster the more familiar is the word) and immediate access to meaning. 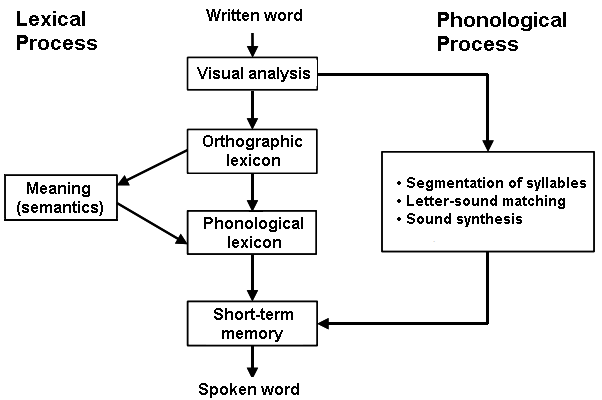 Each of the two procedures for reading (or writing) is implemented specifically for the treatment of certain types of words: the lexical route or process can only deal with words already learned and whose representations are available within the orthographic lexicon and its phonological correspondence. It is needed when reading or writing irregular words that are not pronounced the way they are written (for example, rough, soared, laugh). Irregular words that can only be handled by the lexical route is used in the evaluation of children with learning disabilities. Lists of irregular words are proposed or presented to test the integrity of the lexical route: a good performance when reading these words shows that the lexical procedure is operational; poor performance in reading irregular words compared to reading regular words or pseudo-words suggests a failure of the lexical procedure. Much of learning is associated with visual cues, so children with vision-related problems may find it difficult to keep up with their peers in an academic setting. In order to assess the relationship between success in an academic setting and vision-related problems, we compared the prevalence of vision-related problems between children with Individualized Education Programs (IEPs) to population-based samples from the literature. An IEP is a written statement that includes a child’s present levels of academic achievement and functional performance, measurable academic and functional goals, alternate assessments aligned to alternate achievement standards (if necessary), and a description of necessary special education services, supplementary aids, and accommodations. An IEP is written by a team of professionals that may include school psychologists, teachers, school nurses, speech and language teachers, and medical specialists in order to set measurable goals and establish a guide for the child’s special learning needs. Eye care professionals completed a visual examination on children with an IEP. The prevalence of a variety of conditions exhibited by children with IEPs was compared to prevalence rates reported in the literature. Data were analyzed for 255 children reported to have an IEP. The average age of the children was 9.6 years. Higher prevalence rates were reported for IEP patients than for samples from the literature for myopia (9 of 13 studies), hyperopia (10 of 13 studies), astigmatism (6 of 9 studies), anisometropia (myopia oy hyperopia different in each eye) (3 of 4 studies), and strabismus (6 of 6 studies). The entering distance visual acuity of IEP patients was 20/40 or worse for 23.7% of them, but 7.2% of eyes still had a visual acuity worse than 20/40 after correcting their problem. Of the children who required some form of treatment, 124 (69.3%) had better than 20/40 entrance visual acuity in both eyes. Many of these vision problems would solely be undetected by vision screenings based on distance visual acuity, illustrating the need for comprehensive vision examinations for children who are struggling academically. (1) Walline JJ, Johnson Carder ED. Vision Problems of Children with Individualized Education Programs Journal of Behavioral Optometry. Volume 23/2012/Number 4. It has been estimated that 80% of learning is obtained through vision. Although there is no scientific evidence for this statement, few disagree with the assertion. Scientists have found significantly lower achievement test scores, as well as reduced letter and word recognition, receptive vocabulary, emergent orthography, and verbal and performance intelligence quotients among children with uncorrected hyperopia. Furthermore, children with learning disabilities exhibit a greater prevalence of vision-related problems than the entire population. Certain vision problems that may affect learning, but not all, are related to refractive problems (hyperopia, astigmatism and less with myopia), so vision examinations may provide helpful information in the management of children with learning disabilities. But, what if a child with an IEP also has a vision problem? Wouldn’t that pose a risk to the child responding effectively to their IEP? To attempt to answer this question, 3 states in the US (Illinois, Kentucky and Missouri) have mandatory eye examinations for children before Kindergarten. Only Arkansas, North Carolina, Oklahoma and Massachusetts require examinations for children who fail a school vision screening. And only Ohio and Massachusetts require examinations for children with learning difficulties. Sixteen states do not even require vision screenings for children. Regardless of the state laws, when an eye examination has not been performed by a qualified eye doctor, the school will typically provide a vision screening to determine that vision is functioning “normally”. However, here is where problems begin to surface. Vision screenings are predominantly an eye sight test. That is, if the child’s visual acuity (eye sight) is better than 20/40 they pass the vision screening! Even more critical to the question of the validity of a school vision screening was another startling conclusion of the team which found that out of the 179 that required treatment, 124 (69%) of the children with IEPs would have passed the school vision screening test. That is to say, nearly 70% of those children with an IEP were identified with treatable vision problems and yet would pass the vision screening because their vision problem did not affect their distant eye sight! If you are a teacher, insist that any child who has an IEP be seen by an eye doctor who will provide a thorough vision evaluation and provide you with feedback about the results. If you are a parent, whose child struggles in reading and learning and/or has an IEP, it is imperative that you seek help by a doctor who is thorough, enjoys working with children and either provides office-based vision therapy or will refer you to a qualified doctor who provides office-base optometric vision therapy. An IEP is a written plan. It is a working document that describes the strengths and needs of an individual exceptional pupil, the special education program and services established to meet that student’s needs, and how the program and services will be delivered. It also describes the student’s progress. An IEP should be based on a thorough assessment of the student’s strengths, interests, and needs. It should identify specific goals and expectations for the student, and should explain how the special education program will help the student achieve the goals and expectations set out in the plan. The special education program and services the IEP describes should be modified as necessary by the results of continuous assessment and evaluation. A student’s IEP should be developed, implemented, and monitored in a collaborative manner. The educational growth of a student is best accomplished through the mutual efforts of, and close communication among, the student, the student’s parent, the school, the community, and other professionals involved with the student. The IEP provides an opportunity for all those involved with the student to work together to provide a program that will foster student achievement and success. a document to be used in conjunction with the provincial report card. The authors say that studies comparing binocular eye movements during reading and visual search in dyslexic children are inexistent. In the present study they examined ocular motor characteristics in dyslexic children versus two groups of non dyslexic children with chronological/reading age-matched. Binocular eye movements were recorded by an infrared system (mobileEBTH, e(ye)BRAIN) in twelve dyslexic children (mean age 11 years old) and a group of 9 chronological age-matched and 10 reading age-matched non dyslexic children. Two visual tasks were used: text reading and visual search. Infrared devices permit recording eye movements on a graph for further analysis. Independently of the task, the ocular motor behavior in dyslexic children is similar to those reported in reading age-matched non dyslexic children: many and longer fixations as well as poor quality of binocular coordination during and after the saccades. Note: If the age reading scores are similar in both groups of children, and one of the group includes dyslexic children, we could assume that the group of children called “normal readers” have not scored very high on the reading task (like the dyslexics). That would explain the behavior of eye movements (ocular motor) of the two groups is similarly ineffective. Difficult to understand? According to the authors, for the two groups of dyslexic and non dyslexic children, the two tasks (reading and visual search) produced similar effects in terms of fixations and in terms of binocular coordination. It is believed that reduced visual and attentional span (or “visuo-attentional window”) which limits the number of letters that can be processed simultaneously, could have a similar impact on reading and visual search, due to the visuo- attentional demand similar in both tasks. Most likely, at least for these two groups of children for whom reading skills are not yet well structured, reading and visual search has important requirements in the spheres of vision-perception, attention and space processing. 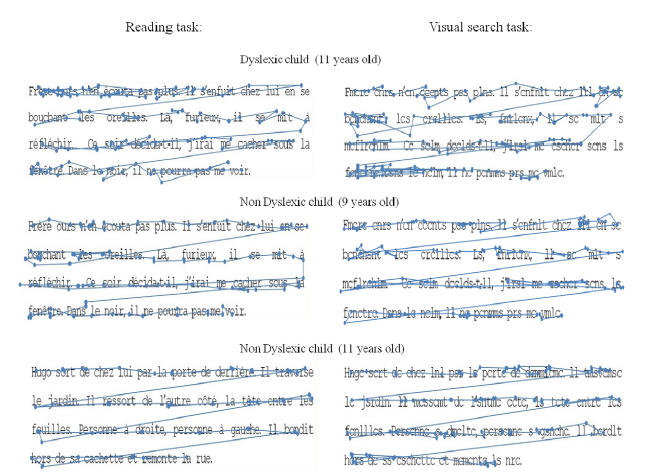 In contrast, chronological age-matched non dyslexic children showed a small number of fixations and short duration of fixations in reading task with respect to visual search task; furthermore their saccades were well yoked in both tasks. The atypical eye movement’s patterns observed in dyslexic children suggest a deficiency in the visual attentional processing as well as an immaturity of the ocular motor saccade and vergence systems interaction. Recording of eye movements during reading (first column) and visual search (second column). We observe that the number and duration of fixations of the dominant right eye for a dyslexic child (11 years old), a non-dyslexic child 9 years old and a 11 years old non-dyslexic. The dyslexic child shows more fixations and regressions (backward movements). In the second case, the eye movements of the non-dyslexic child of 9 years old are more efficient but still lack precision if we compare the movements of the 11 years old non-dyslexic child. Source: Bucci MP, Nassibi N, Gerard C-L, Bui-Quoc E, Seassau M (2012) Immaturity of the Oculomotor Saccade and Vergence Interaction in Dyslexic Children: Evidence from a Reading and Visual Search Study. PLoS ONE 7(3): e33458. Note: please click on «Reference» in the upper right corner of the page to get more information about eye movements in dyslexic children.